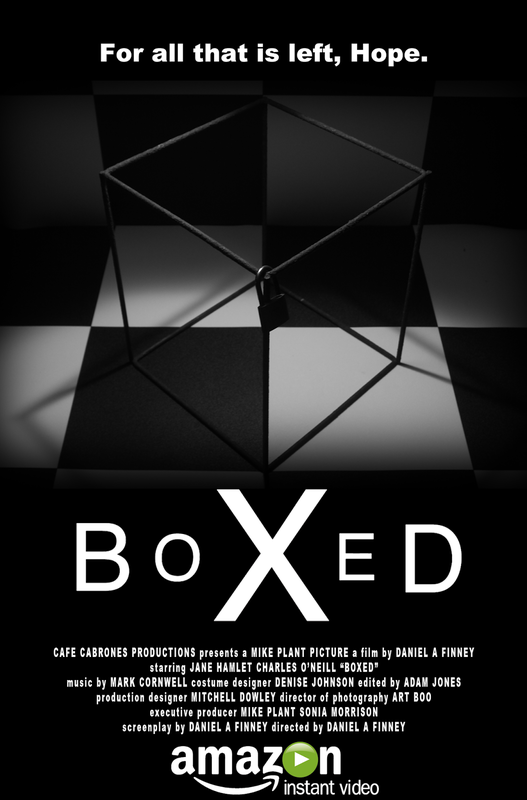 BoXeD is written, edited, produced and directed by Daniel A. Finney and it is an art house film. I used to watch this TV program when I was younger, I believe it was called Headf*ck or something like that and this film brought memories of that show back to me as it featured plenty of similar style videos of which this would have fitted right in. Due to the unique way BoXeD is shown I am not totally clear on the actual plot so this summery may be wrong. Jane Hamlet stars as Rachel whose sister has gone missing, though meanwhile her ex boyfriend Richie Prendergast (Charles O'Neill) is putting pressure on her to display his artwork at her gallery. Flashbacks to a time when her sister was not missing sheds some light on what may have actually happened. To me there are two types of arty films. First you have the ones that have fast editing of random images, bright colours, discordant music, all very loud. Then you have ones like BoXeD that are the complete antithesis of that. This is shot entirely in black and white, it features scenes that are very measured and deliberate, and uses a variety of techniques to slowly drip feed the viewer the outline of a story. The methods used include replaying the same scene from a different characters perspective, dialogues that take place but which the viewer does not get to hear what is being said, the same dialogue being spoken by multiple different characters, and revisiting key scenes over and over again. My favourite scene of the entire film was one set around a piano that featured the main four characters (Rachel, her sister Hope, Richie, and his creepy art collaborator Nicholas). I loved how this was shot, it manages to really sum up the four people without any dialogue at all being said, Hope in particular had such a look of malice on her face. But as Richie says at one point: "Seriously, I don't know what's going on, and it worries me." I have to say I agree completely with that statement. I am quite convinced that a lot of the actual plot of BoXeD went over my head, that is the nature of these types of films but I did find it a bit frustrating. That is not the fault of Finney at all, there is enough here to tell a whole story, yet I was left more confused than anything else. This is a film that doesn't seem to play in any cohesive order, this is on purpose of course and I loved how the circular nature of key scenes gradually revealed more clues. A great example of this is Rachel going into a room and finding Nicholas there, she reacts in shock and asks Richie why he is there. Later on in the film this scene is repeated but this time we get to see the end of it and discover just why Rachel is so surprised. Moments like that perfectly illustrate the general nature of BoXeD. At other times revelations get all a little too abstract for me, such as a mysterious masked figure discovered in a church, and the reveal for a covered painting found early on in the movie. The cast is small but the main four all do good jobs, I was impressed with O'Neill in terms of overall acting ability but for me it was Hetty Bentley as Hope who was the stand out person. Despite having barely any dialogue she was the one who seemed to shine most in the surreal and often times baffling atmosphere. Another key component of BoXeD is the soundtrack itself. Mark Cornwell (who also plays Nicholas) does a fantastic job with a score that is always bleak and foreboding, this music really comes into it's own during the many silent dialogues characters have with each other.